Common names: Terap, pingan, keiran. Marang is probably native to the Borneo in South East Asia. It is found growing there wild. This fruit is however, widely cultivated in the Philippines. It has been introduced in Australia, Brazil and some other tropical countries now. An evergreen tree, up to 25 m tall, 40 cm in diameter, sometimes with low buttresses; twigs 4-10 m thick with long yellow to red, spreading hairs and stipule-scar rings; stipules ovate, 108 cm long, tallow to red hairy. Leaves broadly elliptic to obovate, 16-50 cm x 11-28 cm, cuneate at base to slightly, margin entire or shallow crenate, apex blunt or shortly acuminate, upper half often 3-lobed; both surfaces roughly hairy, lateral veins 13-15 pairs; petiole 2-3 cm long; juvenile leaves pinnatifid. Inflorescences in leaf axils, solitary; male heads ellipsoid to clavate, 4-11 cm x 2-6 cm; female heads with pubescent peltate bracts mostly shed and simple styles exserted to 1.5 mm. Fruit (syncarp) subglobose, up to 16 cm x 13 cm, green-yellow, densely covered with stiff, hairy processes of about 1 cm length; wall ca. 8mm thick; flesh (fruiting perianths) white, juicy, fragrant; peduncle 5-14 cm long. Pericarp (including the seed) ellipsoid, about 12 mm x 8 mm; germination hypogeal. The large fruit is esteemed for the sweet, juicy, aromatic perianths surrounding the seeds, which can be eaten fresh or used as an ingredient in cakes. Many people rate this fruit better in taste and flavour than jackfruit. The edible portion (i.e. the fleshy perianth) of marang fruit is 24-33% of fresh fruit weight; 100 g edible portion contains: water 65.7-84.2 g protein 0.8-1.47 g, fat 0.2-.3g, carbohydrates 32.4g, ash 0.5-0.8g, fibre 0.6-0.77g, calcium 17mg, phosphorus 35 mg, iron 2.1 mg and vitamin C 30 mg. Energy value is 265-510 KJ per 100g. However, it is the seeds of marang which have a very high potential. The seeds when roasted, taste like chestnuts. Each fruit contains about 100 seeds each weighing about one gram on an average. Marang seeds contain protein 11-15 %, fat about 20% and carbohydrates 54-72% on dry weight basis. Young fruit are also cooked milk and eaten as a curried vegetable. 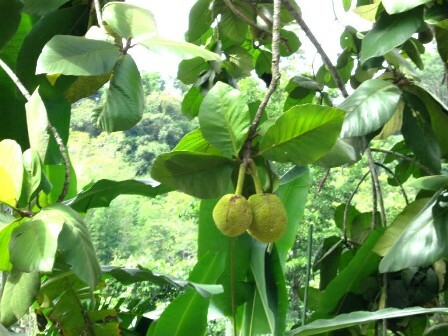 The fruit is already cultivated commercially in the Philippines. An area of 1700 ha is estimated there under this fruit. It is a quite popular fruit there and therefore has a good potential for commercial cultivation elsewhere too. Marang is propagated from seed. Seeds are extracted from ripe fruit, thoroughly cleaned with water and sown immediately in nurseries on sandy loam soil, since they do not retain their viability very long. Seeds germinate in about 4-4 weeks. Seedlings are transplanted to containers when the first leaves have matured. Since the seeds germinate well, they may also be sown directly into containers. Seedlings grow very fast and are ready for planting when they are about one year old. 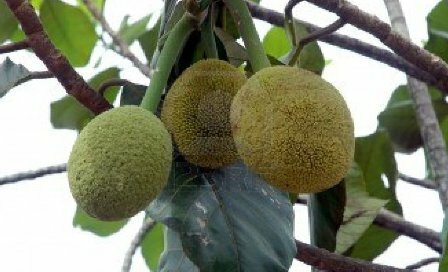 Marang trees can also be propagated by budding on the seedlings of Artocarpus elasticus and Artocarpus altilis. Air layering, which is successful in jackfruit, has not worked in marang. The trees are planted 12-14 m a part in the field. It is best to plant at the onset of the rainy season. Bearing starts at an age of 4-6 years. The trees can become very large with a spreading canopy. The fruits are borne at the end of long flexible branches and ripe fruits are heavy, fragile and difficult to reach for harvest. Regular weeding and irrigation during the first 2 or 3 dry seasons ensures good growth. Plants are fertilized with 100-200g ammonium sulphate after planting and towards the end of the rainy season. 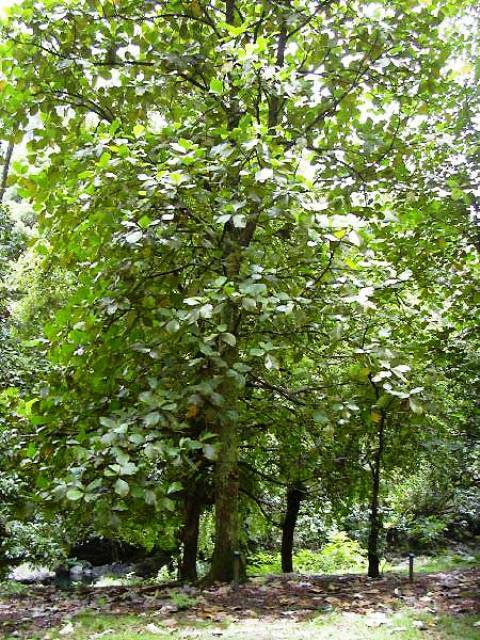 Bearing trees are given 0.5-1kg complete fertilizer per tree twice a year. Pruning is limited to the removal of dead branches. No serious pests and diseases have been observed, apart from maggots of the oriental fruit fly (Dacus umbrosus) found in the fruits. Modern baits sprays have greatly reduced fruit fly damage on other crops and may also be effective on marang. Mature fruits are usually harvested by hand with the help of a curved knife attached to the end of a long bamboo pole. Getting at the heavy fruit at the end of slender twigs is hazardous. The delicate fruit really should be caught to break the fall, but most fruit drops on the ground. The fruit is graded and taken to market in bamboo baskets or sacks as soon as possible; the shelf life of the ripe fruit is very short. 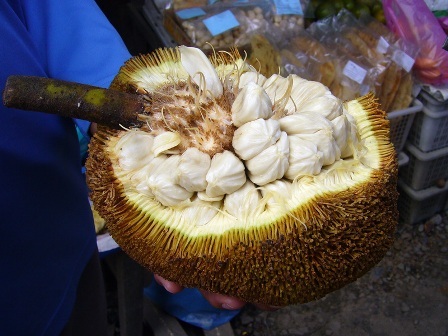 Marang is reported to produce 4-5 tons of fruits per acre in the Philippines. Marang is a highly praised fruit in its genus. It is surprising why this fruit is not widely grown. Low yield and short shelf life offer only a partial explanation, since these features would not deter most home gardeners. This fruit should be widely promoted for cultivation.